Despite the themes of doom and destruction, the primary message of Jeremiah is one of the love and grace of a God who never gives up on those he has called to be his own. The prophet's life is characterized by suffering, but he points to a new beginning, a new covenant and a new hope, eventually made possible through the unique Suffering Servant. Lamentations powerfully expresses personal and national suffering. Yet, even in these utterances of desperate grief, there are glimpses of hope. Lifting out these significant but understated themes in Jeremiah and Lamentations, this commentary by Hetty Lalleman opens our eyes to an important chapter in salvation history. 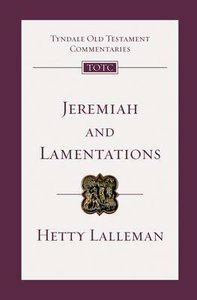 About "Jeremiah & Lamentations (Re-Formatted) (Tyndale Old Testament Commentary Re-issued/revised Series)"
Hetty Lalleman is an associate lecturer in Old Testament Studies in Spurgeon's College London. The Chronicler wrote as a pastoral theologian. The congregation he addressed was an Israel separated from its former days of blessing by a season of judgment. The books of 1 and 2 Chronicles address a divine word of healing and reaffirm the hope of restoration to a nation that needed to regain its footing in God's promises and to reshape its life before God. The Chronicler expounds the Bible as he knows it, skillfully weaving his commentary into the linear text of Israel's history. His theme is straightforward--the promises of God revealed in the Davidic covenant are as trustworthy and as effective as the God who first uttered them. In two volumes Martin Selman provides an excellent interpretation of these sorely neglected yet profound books of the Old Testament. The first volume on 1 Chronicles provides a full introduction that surveys the Chronicler's method, summarizes major theological themes and serves as a valuable entre into the heart of the work we now know as 1 %26 2 Chronicles. The book of Kings is a unique source for understanding the history of Israel from the last days of the united kingdom under David to the eventual fall of the kingdoms of Israel and Judah. Presenting Israel's national history from a divine viewpoint, these narratives measure the kings of Israel and Judah, not by the mark they leave on secular history, but by their 'doing what is right in the Lord's sight'. Embedded in this story are enduring lessons of the ways of God with his people in every age. Donald Wiseman brings to this portion of Scripture his life-long study of the archaeology, history, languages and documents of the Ancient Near East. No other commentary on Kings offers as much historical background and well-considered judgment in such concise and accessible form. Joyce Baldwin explores the meaning of the biblical history of Israel's vital transition from a confederation of tribes to nationhood under a king. The stories of Samuel, Saul and David are among the most memorable in the Old Testament. Yet the lives of these individuals are bound up in the larger story of God's purpose for his people. Looking beyond the well-known surface of these stories, Joyce Baldwin explores the meaning of the biblical history of Israel's vital transition from a confederation of tribes to nationhood under a king. This commentary provides an excellent introduction to the critical issues of authorship, date, composition and structure of Samuel, as well as an able discussion of its theological themes. In two volumes Martin Selman provides an excellent interpretation of these sorely neglected yet profound books of the Old Testament. This volume on 2 Chronicles continues to build on the groundwork laid by its companion in 1 Chronicles. Daniel in the lions' den and Belshazzar's feast are well-known stories, but the book of Daniel can be difficult to understand. It is about the meaning of history, and the church today needs to rely on the certainties it proclaims: 'namely that God is constantly overruling and judging in the affairs of men, putting down the mighty from their seats, overthrowing unjust regimes and effectively bringing in his kingdom, which is to embrace all nations.' Joyce Baldwin's commentary includes discussion of interpretative and critical issues, and additional notes on key topics.